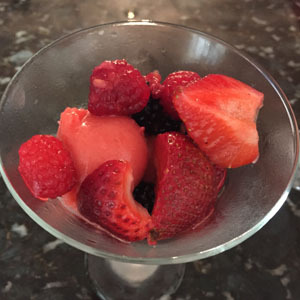 Here are couple of easy, light desserts, both using homemade strawberry sorbet, that will brighten any diner parties, especially during those hot Louisiana summer days! Place a couple of scoops of plain strawberry sorbet in a chilled martini glass and float with Strawberry Brandy. Place a scoop of spiked strawberry sorbet in a chilled martini glass and top with the red fruit salad. Puré in a blender the strawberries and lemon juice. Pass the mixture through a sieve and discard the seeds. In a saucepan, combine the sugar and water, and bring to a boil. In a bowl, beat the egg white until foamy. Keep whisking and gradually add the warm syrup, building a runny meringue. Fold the meringue in the strawberry purée, cover with a plastic wrap, and place in the fridge for a couple of hours. Once the mixture is chilled, pour it into an ice-cream maker and let it churn about 20 minutes. 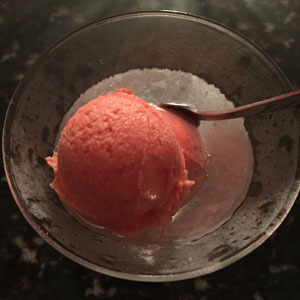 At this time, the sorbet can be spiked by adding the Strawberry Brandy. It will need to churn a few more minutes and the consistency will be softer because of the alcohol. Mix all ingredients in a bowl. Cover with plastic wrap and place in the fridge for a couple of hours.